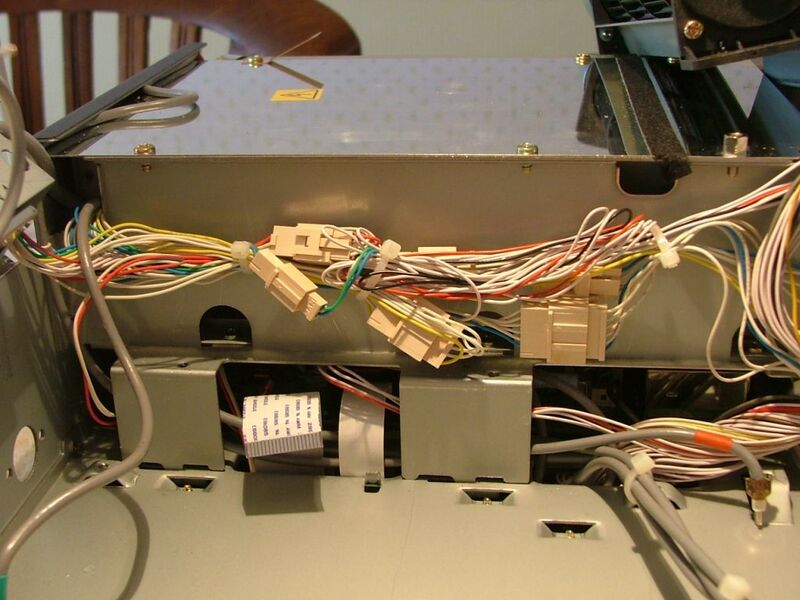 The keyclick modification is very important for serious CW-operators! 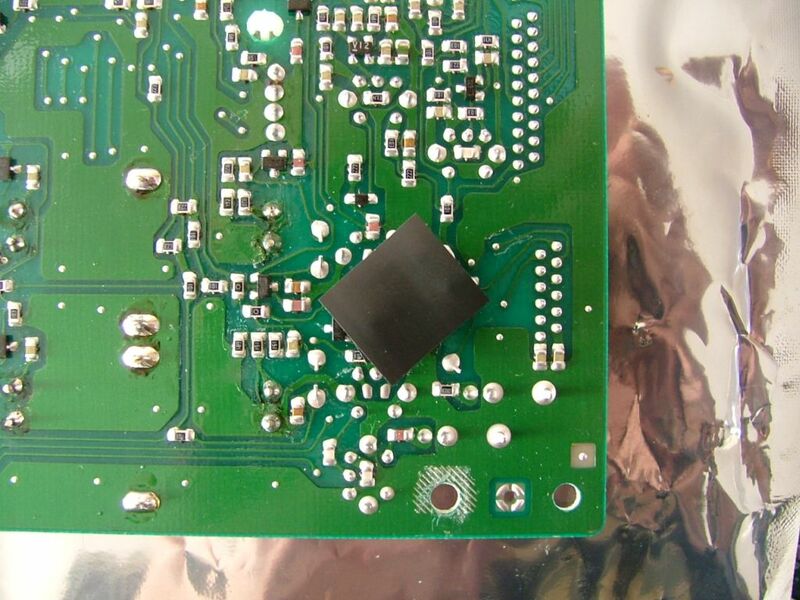 To prevent failures caused by ESD it is wise to take some precautions. Perhaps the work as could be seen on the pictures is not the best example. A grounded antistatic mat is better then a tablecloth and paperwork, by all means. Before soldering the component(s) I put the metal body of the soldering iron for a few seconds on the chassis of the rig to neutralize differences. I do not wear clothes, like Fleeze, which could cause statics. However I admit that taking more precautions would be very wise and advisable. 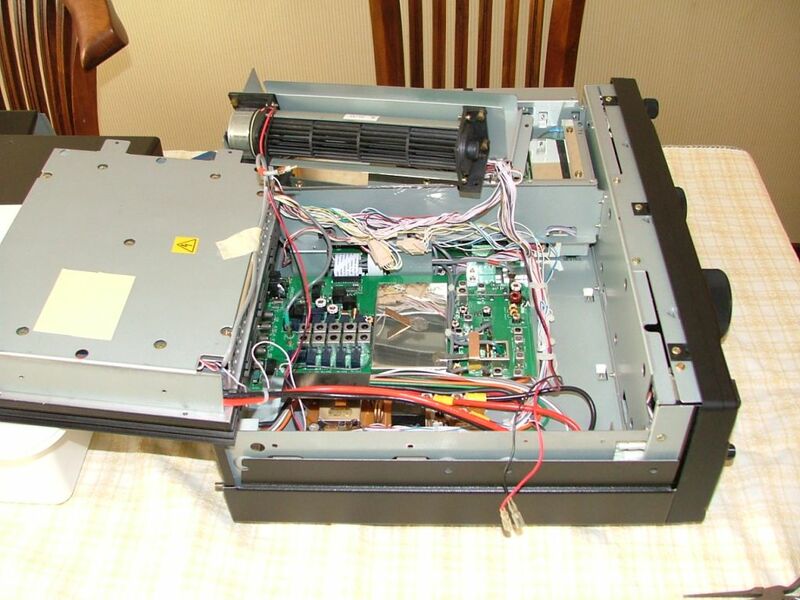 First remove the covers of the Mark-V.
Then lift the PA- and the fan-unit. It is not necessary to remove them. This picture is taken at the same time, but from another angle. 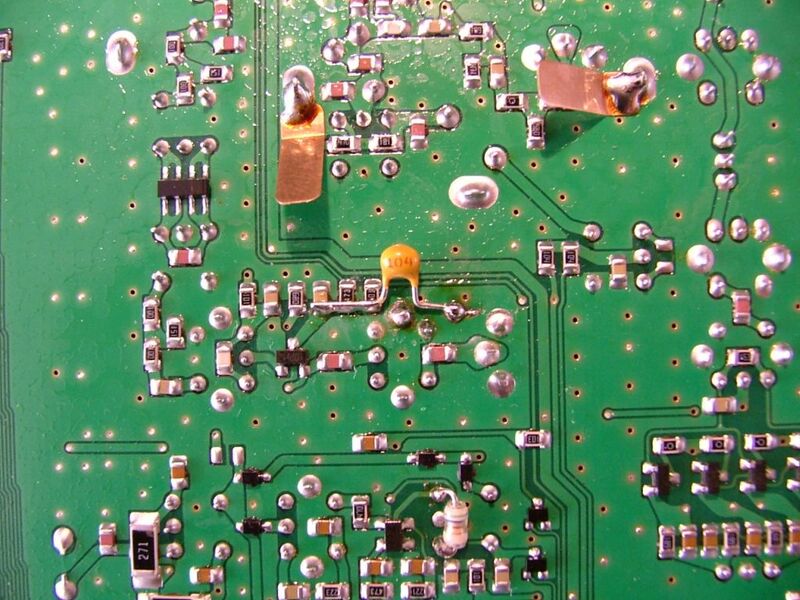 We have to remove the RF-board. Please write down which cables are being released and where they came from! 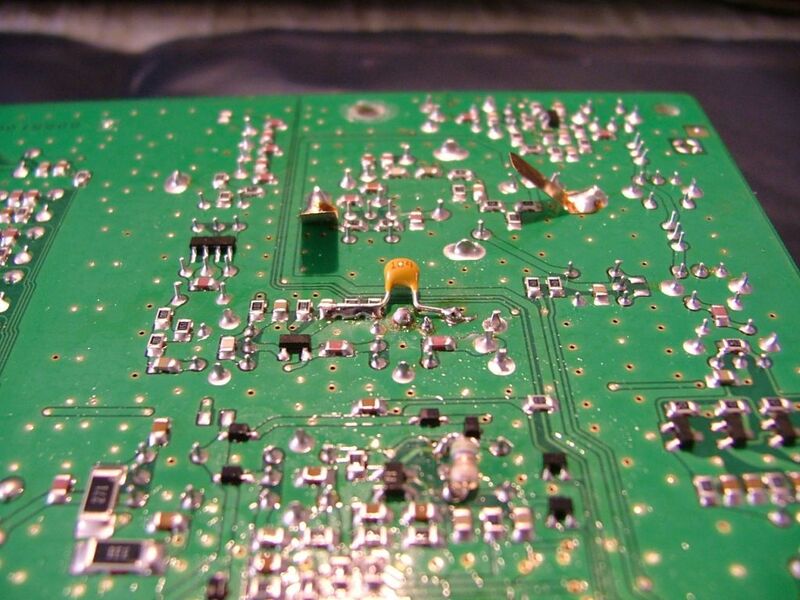 This is the bottom of the RF-board. 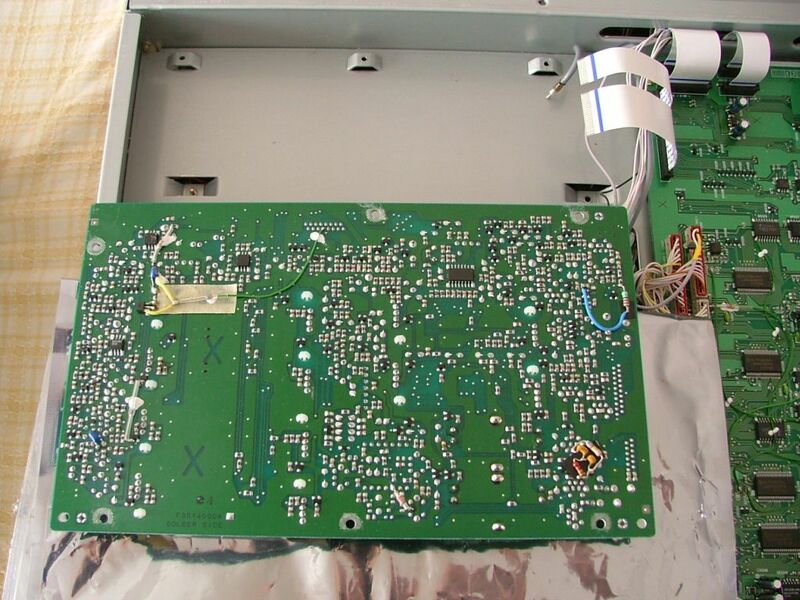 Install the 0,1 uF capacitor between C1004/R1004/R1003 and ground. That's all we have to do on the RF-board for the mod! This is the view from one of the sides. 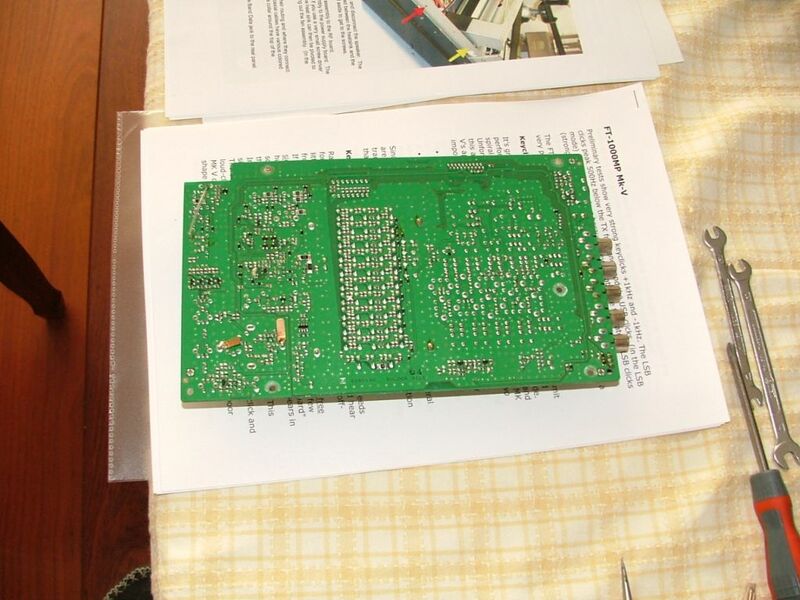 Re-install the RF-board. Take care of the cables. It looks difficult, but it is not. 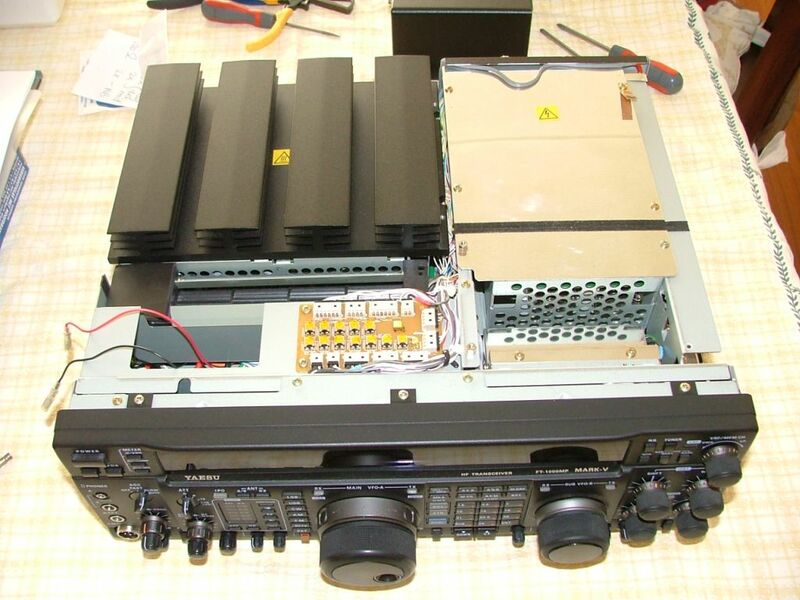 Then re-install the PA-unit. This is IMHO not easy. Be very careful not to damage the thin cables underneath the right side (seen from the frontpanel of the Mark-V) of the PA-unit! To fasten the two screws of the PA-unit I advise a screwdriver with little clamps; this makes the work much easier. What I use is Lip Conditioner on the tip of my screwdriver; this will hold the screw. 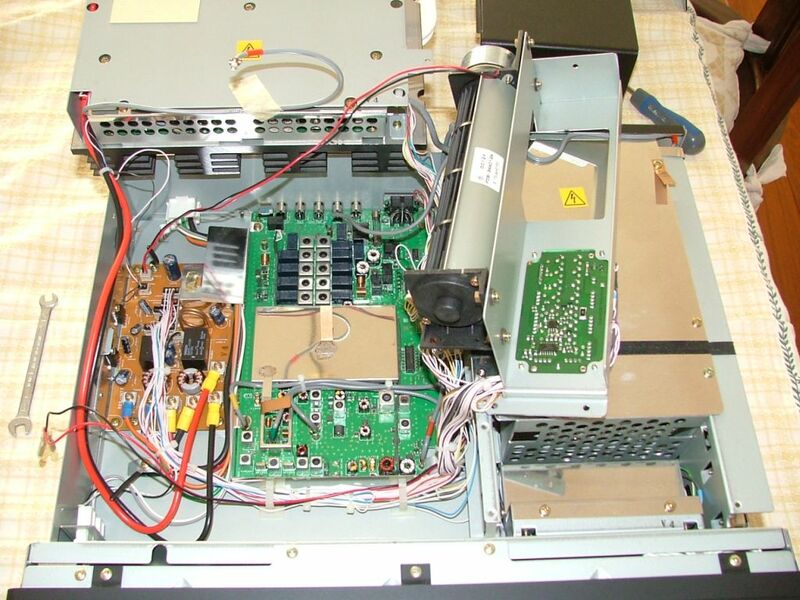 Be careful not to damage the little wires, when you re-install the PA-unit.. I used a few extra cable ties. Now we have to remove the bottom covers of the Mark-V and lift the IF-board (this is the board where the filters are mounted on). 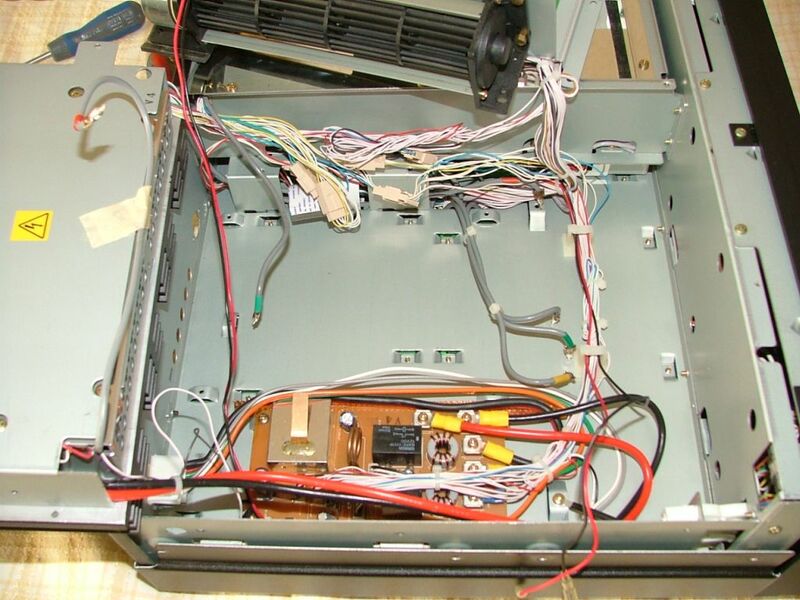 Only remove the necessary cables to lift the IF-board at its side (you will see this on the last photo). 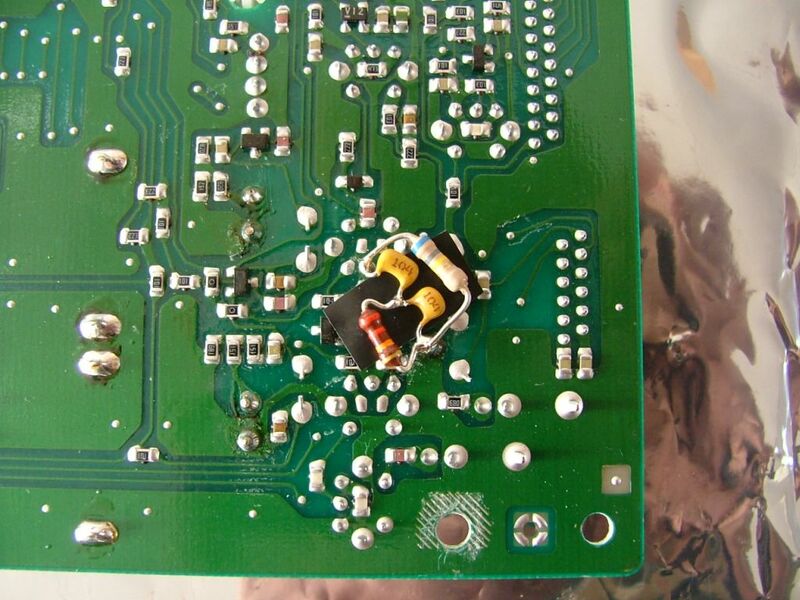 Then solder the two caps of 0,01 uF, the resistors of 22k and 680k between the ungrounded end of C2148 and ground. 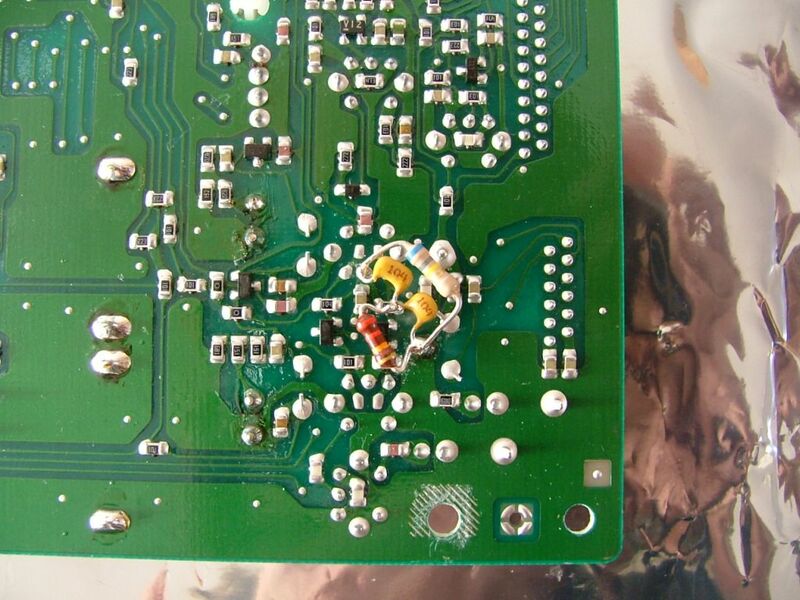 Be very careful that these four components will not touch the PCB or the chassis of the Mark-V! Prevent short-circuits. PVC isolation tape between the mod and the chassis of the Mark-V.
Now lets do the Noise Blanker mod! To do the NB modification first remove R2046. Then mount a 220 Ohm resistor between the source of Q2009 at C2027 and the collector of Q2016 at R2049. There is no need to use a wire. You can mount the 220 Ohm resistor directly between C2027 and R2049, if you want. Re-install the IF-board and the bottom covers of the Mark-V. It took me a couple of hours on a rainy sunday afternoon. I must say that the job was not very difficult. Just take your time! 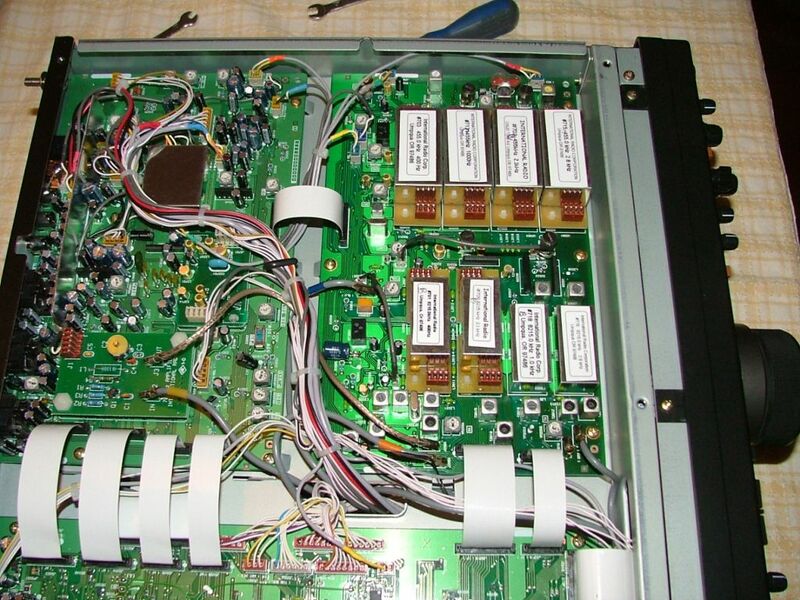 The toughest thing IMHO was to re-install the PA-unit and fasten the two screws without damaging the thin wires. If you want I have a document with other pictures, drawings and text how to do the keyclick modification.